Have you been able to resist the siren song of We Are Knitters? I did, for a while, thinking their kits appealed more to beginners. They come neatly packaged- with needles, pattern, and yarn in the perfect colors- but, at first glance, the sweaters seemed very simple to me. 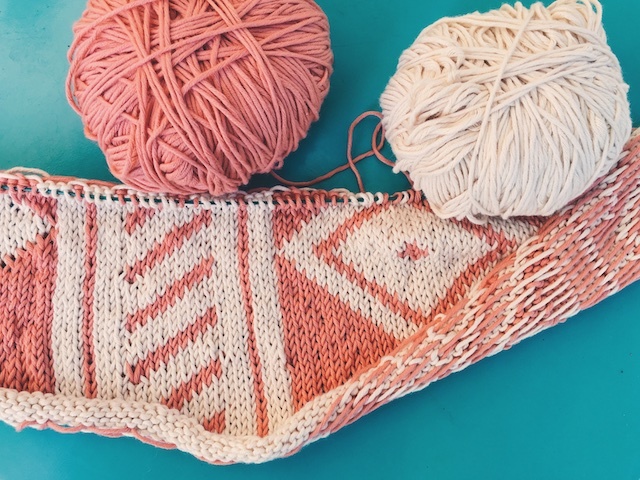 However, as more of their knitwear popped up on Pinterest or in my email, I started seeing some really intricate, interesting knits like the Gesture sweater, the Ocular Sweater, or the Waffle Sweater. So I took a look at their site and found several knits I really wanted to try. Then, they had a 40% off sale, so I had no excuse. 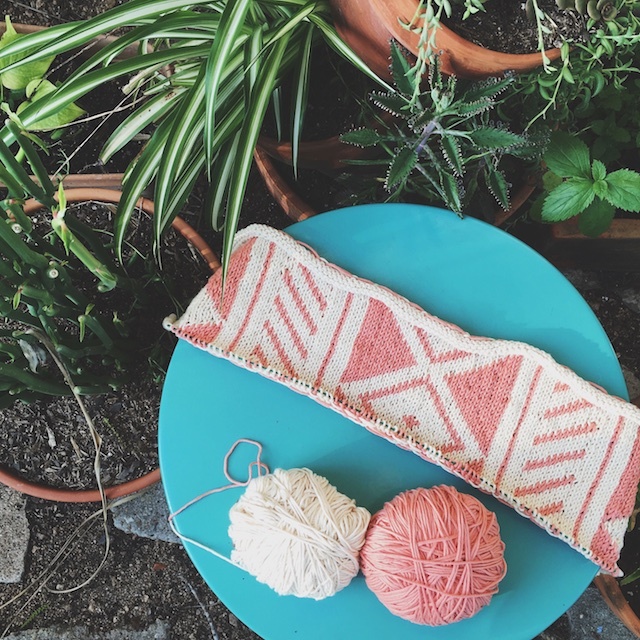 I had to try the Hualpa Kimono because... well look at it: Fair Isle on a summer top, salmon pink, kimono fit, and fringe! Resistance was futile. I saved it until I was finished with several test knits and it was officially summer. And, oh man, it is so officially summer. A quick trip to grab the laundry from the garage leaves me drenched in sweat. I'll probably finish the back piece tonight. 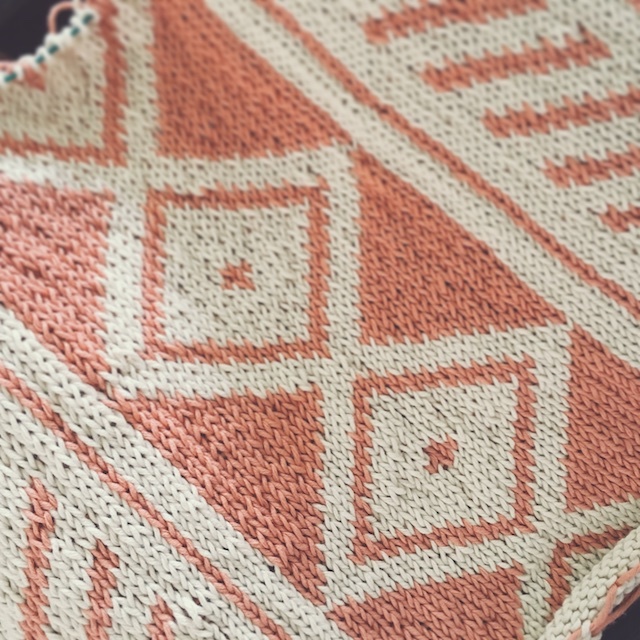 So far, my Hualpo seems to be knitting up at a good, consistent gauge. That was a little laborious. It took some time before I felt confident knitting two handed Fair Isle on the right side. Then, it took even more time before I felt confident doing it on the wrong side because I feared my tension would turn to crap. And it did, actually, when knitting two handed on the reverse side. So, yeah, I knit much of it with one hand, dropping the yarn, moving a ball, then picking up the other yarn strand- blech. That was tedious, but I've hit my stride and I think my tension looks good now. The photo above is my goal. I can't see my back piece being long enough, but I can always add a repeat if I have to. The one below is my reality. I think it will block out well, but look at the mess of floats on the back. Certainly you've seen We Are Knitters on Pinterest or Instagram by now. Or maybe you've seen Alina's beautiful, beautiful Gesture Sweater. I think about her sweater so much that it's bordering on weird. I'm also liking this Sabrina Sweater and the Signage Sweater. So, have you guys tried any WAK kits? If so, how did you like them? I found the pima cotton incredibly smooth and nice to knit with, even if the colorwork made it a challenge.